I’m back, and with turnips!! I have finally figured out my new computer and how to post pictures. Thank you Melissa for all your help. I have enjoyed your posts so much. Although, you set he bar high! I will share a new idea, one from “Fabio”, from the Farmers Market. I wasn’t quite sure what to do with the white turnips in our CSA box, “Fabio”, aka Daniel, suggested I pickle them. They actually were quite tasty if you like that sort of flavor. 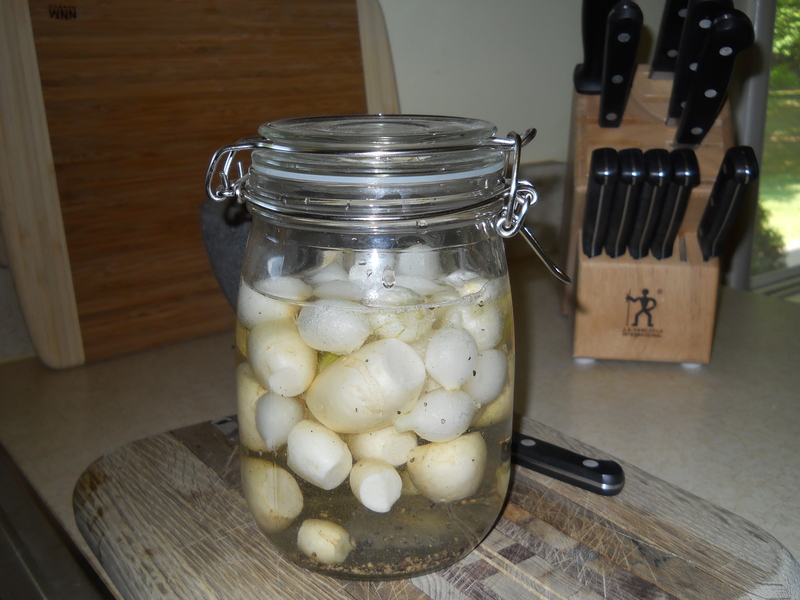 Recipe: fill the jar with 1/2 water, 1/2 white vinegar, garlic , pearl onions, black peppercorns & a few bay leaves. In the fridge for a few days and done. Could use this method with a lot of veggies I imagine. I am fortunate, that if I try something new and I don’t like it, there is always GP! This entry was posted in General on July 18, 2012 by andrewsbeth. Yippee! I’m so happy that all the technology problems are worked out and you can post again. I bet Brian would have liked these too – he seems to like pickled anything! Those look tasty! I am glad you are back to posting, Bethy! Kim and I will do a post as soon as one or the other of us make something else besides roasted beets, steamed potatoes, or sauteed squash. Does thinking regular shelling peas are sugar snap peas and using them in a stir fry count?